Credit: Fossil lizard images courtesy of Nicholas Edwards and Wang Yuan. 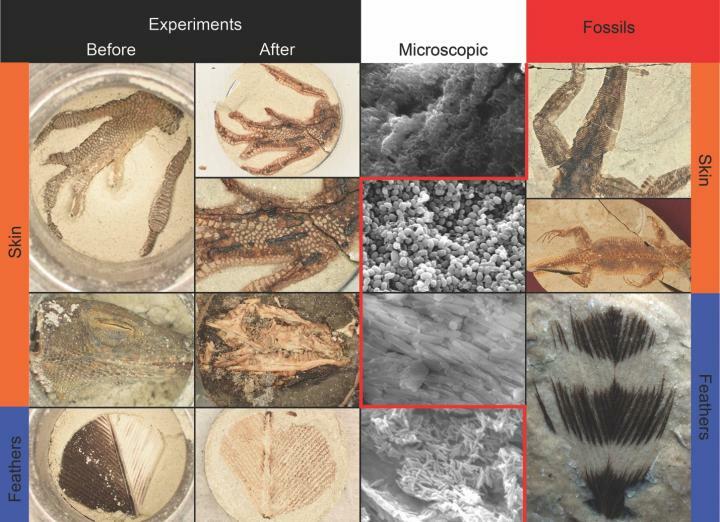 In addition to directly studying fossils themselves, experimental treatments of fresh organismal remains can be utilised to study fossilisation. One commonly employed experimental approach is known as 'artificial maturation', where high heat and pressure accelerate the chemical degradation reactions that normally occur over millions of years when a fossil is buried deep underground and exposed to geothermal heat and pressure from overlying sediment. Maturation has been a staple of organic geochemists who wish to study the formation of fossil fuels and is in some ways similar to the more intense experimental conditions that produce synthetic diamonds. More recently, maturation has been used to study the formation of exceptional fossils that preserve soft tissues as dark, organic films in addition to mineralised tissues like bone, including fossil dinosaurs from China with organically preserved feathers. However, much maturation equipment is often limited by the use of small, sealed chambers which trap not only the highly stable organic molecules of interest to palaeontologists and organic geochemists, but also the breakdown products of less stable molecules that are less likely to be retained in fossils. Therefore, direct comparisons between the experiments and the fossils become complicated. For example, when Evan Saitta, who recently submitted his PhD at the University of Bristol's School of Earth Sciences and is now a postdoctoral researcher at the Field Museum of Natural History in Chicago, ran these more traditional maturation experiments on feathers during his MSc (also at Bristol), the result was a foul-smelling fluid. Jakob Vinther, senior lecturer at Bristol's School of Earth Sciences and School of Biological Sciences as well as Saitta's PhD and MSc advisor, added: "What we are coming to realise is that fossils aren't simply a result of how fast they rot, but rather the molecular composition of different tissues. However, it is inherently difficult to take the conceptual leap from understanding chemical stability to understanding how tissues and organs may, or may not, survive." Saitta said: "By the end of my MSc, I became a bit ambitious. If maturation was known to be a useful simulation of fossilisation processes, I thought to myself, then running these experiments on specimens compacted in sediment might just produce 'synthetic' fossils. Fossils form in sedimentary rocks, which can be porous and would allow for volatile degradation products to escape." Saitta then teamed up with Tom Kaye of the Foundation for Scientific Advancement who provided the engineering experience required to see the idea to fruition. Kaye said: "My lab deals with high pressure devices all the time. We had the capability of compressing matrix around the specimens which was the game changer simulating burial. Our next step is to expand the system to take large specimens." As the researchers describe in their new paper, published this week in the journal Palaeontology, the results did not disappoint. Saitta explained: "The sediment acts as a filter allowing unstable molecules to escape from the sample, revealing browned, flattened bones surrounded by dark, organic films where soft tissues once were. "These results closely resemble exceptional fossils, not just visually, but also microscopically as revealed using a scanning electron microscope." Microscopic, pigment-bearing structures called melanosomes reside within the organic films in feathers and lizards treated with the new method while unstable protein and fatty tissues degrade and are lost, just as in exceptional fossils which have been used by scientists such as Vinther to reconstruct the original colours of dinosaurs. Preliminary tests on leaves and beetles are also encouragingly comparable to their fossil equivalents, and tree resin can even be hardened in a manner resembling fossil copal or amber. The researchers say the new method of sediment filtration represents an improvement upon earlier maturation experiments and will allow for the testing of many hypotheses regarding organic preservation in fossils and sediments. Future additions to the protocol will incorporate other aspects of fossilisation beyond simulation of the heat and pressure of deep burial.